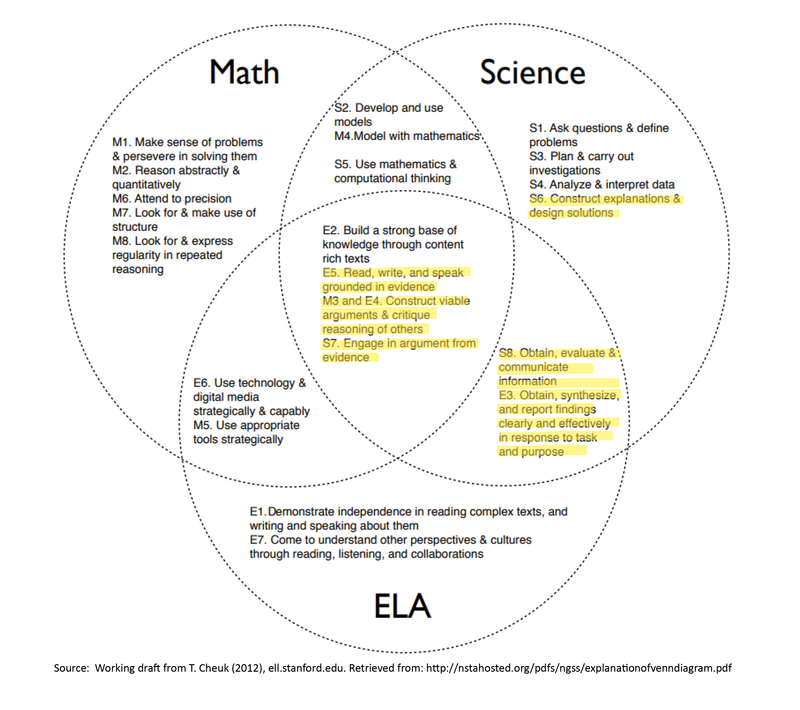 If you were to draw a Venn diagram of practices in the Math, Science and ELA standards, you would see that several discursive practices overlap (right image). Math, science, and engineering all require the ability to support an argument from evidence, critique the reasoning of others, and clearly communicate conclusions. In a related resource, listen in as DR K-12 PIs Joe Kracjik and Kate McNeill talk about the Claim, Evidence and Reasoning (CER) framework in a NSTA Lab Out Lab podcast. The Argumentation Toolkit is an online collection of free resources designed to help teachers understand and teach four elements of argumentation that students need extra support around: 1) evidence, 2) reasoning, 3) student interaction and 4) competing claims. 45-minute teacher learning modules (complete with agendas, presentation slides and other resources) to use with preservice or inservice teachers as part of professional development or other teacher learning experiences. This video series highlights key principles and strategies for engaging K-2 students in the practice of scientific argumentation with explanatory models as they explore an authentic question: What caused the town of Moncton to flood? The practices of scientific argumentation and modeling involve using evidence and reasoning to create and evaluate claims about how or why something happens in the world. For example, why did a town flood in 1915 when a dam was built nearby? Scientists and science learners develop an understanding of the world through constructing arguments and models and determining which best account for observations at a given time. The Next Generation Science Standards (NGSS) invite all students — including primary students — to engage in argumentation and modeling as interconnected practices. Learn more about the project in this video. Quality Talk Science (QTs) is an innovative, scalable, teacher-facilitated discourse model. QTs can be used as a tool to promote students’ critical-analytic thinking and reasoning in physics and chemistry, as well as to analyze Quality Talk discourse. QTs ensures active learning that fosters conceptual understanding and real-world application through increased productive and engaging student-led class discussions. Learn more in this video. This paper reports on a synthesis of empirical research published between 1991 and 2015 about mathematics writing, a form of discourse, in grades 1-12. The Elementary Mathematical Writing Task Force, made up of practitioners and researchers, was charged with proposing the types of and purposes for mathematical writing. The task force recommends four different types of mathematical writing driven by numerous purposes that position students to reason. Providing a framework for the types of and purposes for mathematical writing enables elementary teachers to leverage writing for students’ learning of mathematics and lays the foundation for future reasoning and proof writing. Learn more in this video. This article distinguished between “writing about mathematics” and “mathematical writing,” with the latter positioning students to reason mathematically. It presents exploratory, informative/explanatory, argumentative, and mathematically creative writing along with key questions to consider to help teachers make instructional decisions to help students engage in this form of discourse. Funded by NSF Project: A Task Force on Conceptualizing Elementary Mathematical Writing: Implications for Mathematics Education Stakeholders. A step-by-step guide to mathematical argumentation in middle school classrooms, with activities, games, and lesson planning tools. The book presents a four part model for argumentation, provides tasks conducive to argumentation, and presents teaching moves that can be used in each part. Based on research and development done in NSF Project: Preparing Urban Middle Grades Mathematics Teachers to Teach Argumentation Throughout the School Year. Facilitating meaningful mathematical discourse is dependent on the launch of the lesson where teachers prepare their students to work on the task. This article discusses the use of the Think Aloud strategy at the beginning of a lesson to model to students both the type of thinking that develops conceptual understanding, as well as how to share one’s thinking. The Think Aloud strategy is one of a number of discourse strategies introduced in Project AIM (All Included in Mathematics), a 40 hour professional development program focused on promoting meaningful mathematical discourse in elementary classrooms. The article provides examples of teachers’ experiences using the Think Aloud in their classrooms to support discourse, and highlights some of the successes and challenges that come with implementation. This article presents an instructional strategy called Mathematical Bet Lines that was designed to promote classroom discourse and sense-making for all students, in particular English Language Learners. Introduced in Project AIM (All Included in Mathematics), a 40 hour professional development program focused promoting meaningful mathematical discourse, the Mathematical Bet Lines strategy supports comprehension of story problems by having students articulate to themselves and others their predictions regarding what is happening in the problem as it is revealed one sentence at a time. With Mathematical Bet Lines, as students make bets, the teacher facilitates students’ reflections on their own sense making of the story problem by asking follow-up questions. After describing the strategy, the article illustrates one teacher’s implementation of a lesson where she used the strategy with her second grade students. It concludes with other teachers’ reflections on using Mathematical Bet Lines in their instruction and helpful tips for classroom implementation. Funded by NSF Project: Project Aim: All Included in Mathematics.